The US is ramping up the controversy over alleged violations of a key missile ban treaty to cover up its own plans to deploy missiles in Europe, a top Russian military official said. Deputy Defense Minister Anatoly Antonov was commenting on a reported plan by the US to deploy nuclear-capable intermediate-range cruise missiles in Europe and Asia targeting Russian territory. The plan was cited by AP, which said it was penned by the office of US General Martin Dempsey, chairman of the US Joint Chiefs of Staff and contained several contingencies for a scenario in which a key missile treaty between US and Russia fails. The deployment may be possible after scrapping the 1987 Intermediate-Range Nuclear Forces Treaty. The Cold War agreement banned ground-based cruise and ballistic missiles with ranges between 500 km and 5,500 km. “Apparently, the US is ramping up the issue of ‘Russian violations’ to justify their own ostensibly responsive military action that would be aimed at ensuring American ‘leadership’ in confrontation with the mythical ‘Russian military threat’ that Washington drums up regardless of all facts to the contrary,” Antonov said. He added that the ministry requested formal comments from the US on the AP report and that if it were true, it would lead to dangerous consequences. “We stated our commitment to the INF treaty on many occasions. We believe that the return to Europe of American short and intermediate range missiles and their deployment in other regions, from which they would threaten Russia and other nations not following Washington directions would have a negative impact on global security and stability,” Antonov said. He added that the two parties should hold expert discussions of any differences they have, including Russia’s complaints over the US part of the bargain. The INF treaty was signed to get rid of massive arsenals of nuclear missiles that were deployed in Europe and were considered too risky to keep, because their short travel times left little margin for error. Under it almost 2,700 intermediate-range missiles were scrapped by the two sides. However Washington and Moscow have been trading accusations of violations from the INF treaty for years. 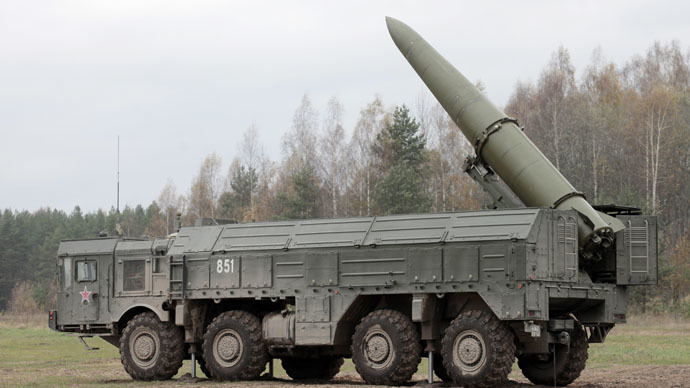 The US claims that Russia has a cruise missile launched by Iskander launcher that has a range over 500 km. Another one, called Rubezh, which is currently in development, is classified as intercontinental with a range of 6,000 km, but Washington alleges it can hit targets closer than 5,500 km. Moscow, for its part, accuses the US of deploying intermediate-range missiles in the form of target missiles for testing of its anti-ballistic missile systems. More recently Russia complained that the US is deploying missile launchers in Romania as part of its controversial ABM shield in Europe. The launchers are meant for SM-3 interceptors, but are capable of firing Tomahawk cruise missiles. Normally Tomahawks are launched from warships, but the launchers in Romania effectively make them ground-launched and thus violating the treaty, Moscow argues. Some strategists in Russia are also concerned about the US drone fleet, saying that the operational ranges and pilotless nature of strike UAVs like the MQ-1 Predator essentially make them indistinguishable from short-range cruise missiles. The latest round of the blame game between Russia and the US over the INF treaty came in April, when the US Secretary of State and Russia’s top nonproliferation diplomat voiced their complaints at the UN General Assembly.